Ordering system is pretty straight forward.There are no meal deals here, so you order what you want. For your burgers you can order a single or a double. 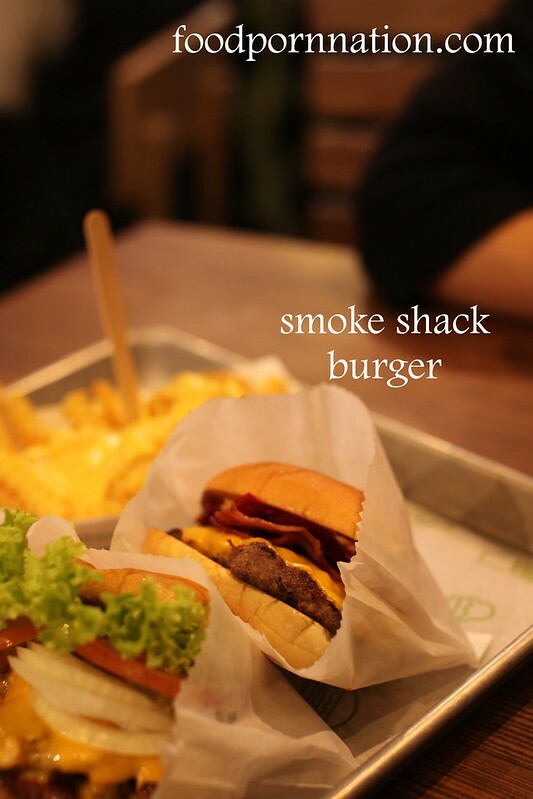 My sister goes for the smoke shack – single (£6.50). A beef patty with cheese, British free range bacon, pepper sauce and shack sauce. We both agree that this isn’t the best of the bunch. It is the pepper sauce that it is undoing. 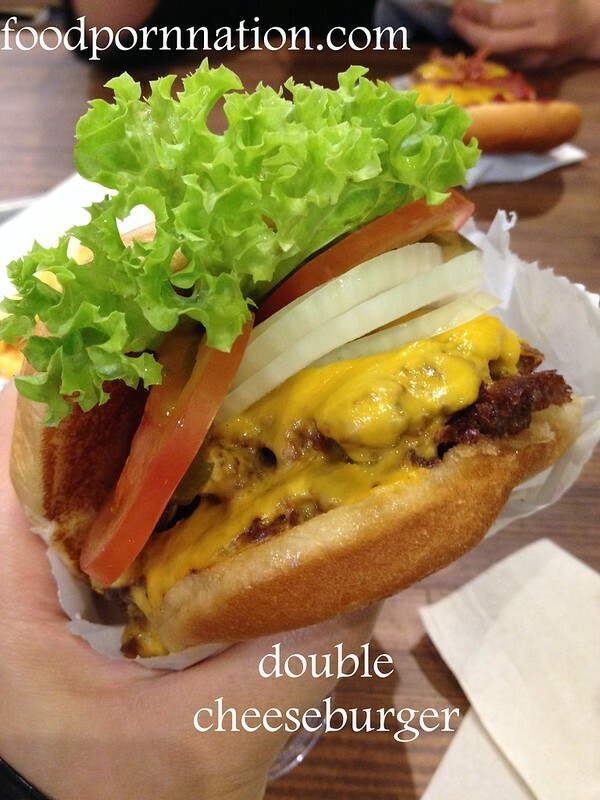 I couldn’t resist going in for a double – naughty me. The double cheeseburger (£7.25) has an opt in policy so I ask for all the trimmings. The onions, the pickles, tomatoes and lettuce and this is served with their shack sauce. This is bloody brilliant and my sister loves it too! I love the juicy patty and gooey cheese. The onions and lettuce add a lovely crunch and the glorious shake shack sauce holds it together beautifully. It is one of the best double cheeseburgers of my life. I’m naughty again and I come back for seconds the next day. I skipped breakfast and had this for lunch. Bearing in mind, that this was my dinner the day before, so this is my second consecutive Shake Shack meal. I go in for a double again. While Emma G goes for the single Shake Shack burger (£5.00). She takes one bite and her face instantly lights up. We decide to get the cheesy fries (£3.50) and our hearts skip a beat. It is perfection, gooey warm cheese against a crunchy crinkle cut chips. I love crinkle cut! Don’t worry, if you like it soggy. There are some soggy bits too! As mentioned, the concrete is made from frozen custard. Depending on which one you choose it has local decadent treats thrown in and whizzed up at high speed. You can also go in for a single (£4.00) or a double (£6.50). 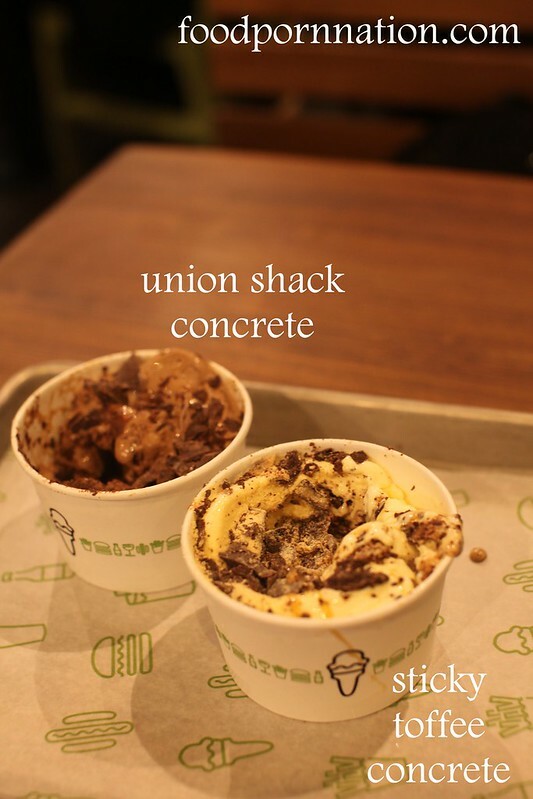 The Union Shack Concrete (£4.00) is for you choc-aholics anonymous out there. It has chocolate custard, St John’s chocolate hazelnut brownie, paul.a.young chocolate (both very popular bakeries and chocolate house in the UK), chocolate fudge and sea salt. It was far too rich for me but my sister takes it all in. I have the sticky toffee concrete and it is absolutely delicious (£4.00) and I love the silky smooth texture. My spoon literally glides through it picking up pieces of vanilla custard, paul.a.young chocolate, chocolate toffee, salted caramel sauce and malt powder. YUM! This is so good, I already want to go back for thirds but good old self control kicks in – only just. It’s a shame we don’t have this in Australia! Their burgers are so very pretty! Kicking myself that we didn’t make room for some concrete! The concretes were awesome! At least u have something to look forward to when back! Those burgers look so droolworthy! I know, I got to stop staring!! Ohhh man this looks incredible. Also wishing we had one of these in Australia.. Hopefully one day in the future?!? Those cheesy fries and the concrete look like they are to die for..
i didn’t even think to try this when I was in NYC back in 2009! Looks amazing, though I’ll have to see for myself who wins the battle between IN-N-Out VS Shake Shack! I can’t wait to have another one of these when I head back to NYC! I really wish they’d expand to Australia so I could expand with them. We went here in London back in September.I LOVED it…it wasn’t as great as the one I had in NYC, but it was darn close.I had TWO burgers in one sitting! haha the thought seriously raced my mind too! I’ve been to New York three times and still haven’t stepped into Shake Shack. When you mention “concrete” I wasn’t quite sure what you were referring to. I did, however, try some soft serve custard elsewhere in the States. I wonder if it’s the same? I bet its the same! Must be an American thing. 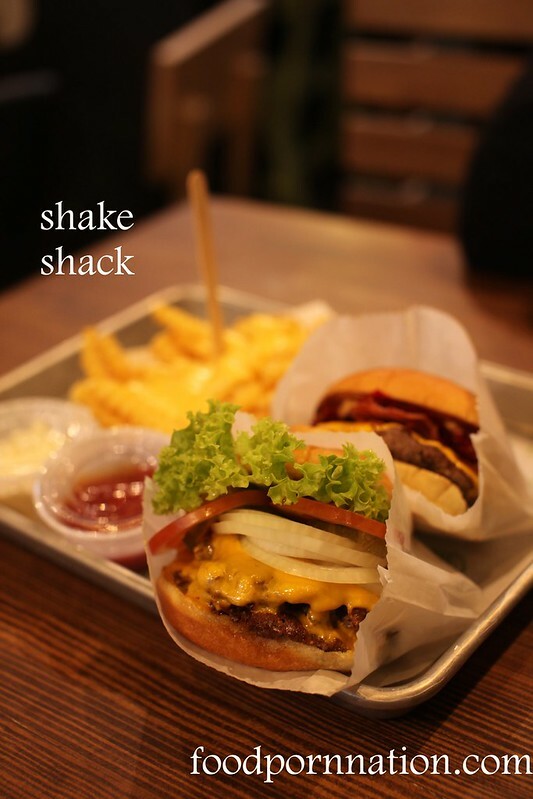 But Shake Shack – you gotta go! You would love this place Raf. Right up your alley you burger addict, you! Trust me. It’s much harder ‘knowing’ what you’re missing out on! I am drooling over those cheese fries! The cheese looks like golden liquid perfection.